Goodnight Moon is one of my favorite children’s books. I don’t remember reading it a s a child, but I love reading it to my friend’s kids when I’m watching them. It’s such a cute, simple bedtime story! So when I saw Goodnight iPad, I was kind of traumatized! What happened to the kittens and mittens, the brush and the mush??? Why did everyone in the new version (which hits scarily close to home) seem so angry? Since I got my laptop my freshman year of college, I’ve joked that we are attached at the hip. Yes, my laptop and I. It was (is?) the first thing I checked when I got up in the morning and the last before I went to bed at night. I rarely didn’t have it with me, and I even dragged it across Europe. Now, I was very dependent on it for school and since DAAP didn’t actually let you take breaks or vacations, it was pretty necessary that my laptop and I were so close. 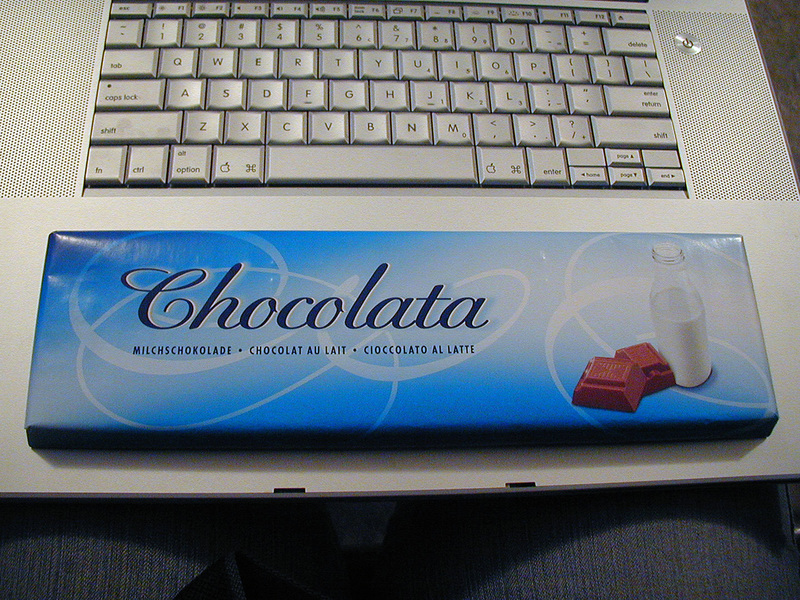 Laptops in Switzerland are useful for conveying the size of your chocolate bar to family at home. Even after I graduated, I spent a good portion of my at-home time in front of my computer, emailing, reading blogs, the black hole of Facebook, etc. Nate and I have a pretty nice TV, but we don’t use it all that much. Nate plays (plenty of) video games on it, but except for football season we wouldn’t miss the cable and I can’t tell you the last time we watched a movie on it. But without our computers, I’m pretty sure we’d both be lost. Then, a few months ago, I acquired an old iPhone that was no longer phone-worthy. So I now have an iPod touch which has totally changed how I use technology! It’s convenient, I can take it anywhere, it entertains both me and kids (thanks to the handy kids apps I put on it!) and has me CONSTANTLY searching for a wireless signal. All this to say that it’s TOO MUCH! The silly little parody of Goodnight Moon has convinced me to reign in my technology use! So, I’m turning off my screens at 9PM. I’ve been trying for 3 days now, and I’ve only been marginally successful, but I’m trying. This should be good for a lot of things. Like my marriage. And my sleep schedule. Oh, and those tests I keep referring to. It should also be good for my blog writing. Believe it or not I write most of my posts in pen on paper. In a notebook, the red one. I like it better and it’s hard to get distracted by blinking lights when all you’re looking at is a sheet of lined paper. And I tend to spend more time reading other peoples’ blogs than writing my own when I’m on my computer, anyway. So, we’ll see how this goes. You’ll know if I hate it if it keeps coming up. 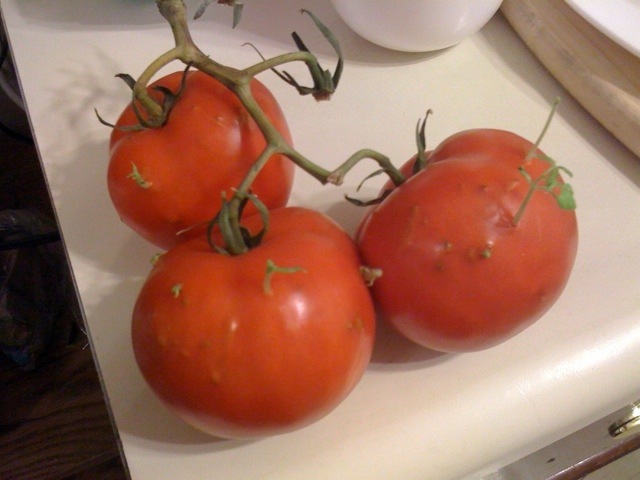 your tomatoes start sprouting baby tomato plants. So I’ve been a little preoccupied and I’ve neglected many things. I would like to say it’s going to get better, but I’m probably not going to find extra time anytime soon, what with the holidays approaching and Nate and I deciding – kind of on a whim – to buy a house. Yeah, when (if?) we finally move in I’ll write all about that craziness. So if I’m spotty until about the middle of January, it’s because I can hardly find time to pick out which shoes to wear in the morning, much less have time to write. Although I will say the constant stress and motion of home-buying and the holidays does not leave much time for feeling discombobulated and fed up with one’s life. So that’s been good. I’ll try to update when I can and send pictures when I take a fun one, and hopefully I can get this blogging thing back on track in 2012! You ladies are wonderful! When I posted last week, I felt a bit silly. Here I was with everything I could need or want, COMPLAINING about all the opportunities I had! But you were all so supportive! And every reaction I got about that post basically started out “ohmygosh, ME TOO!” Which helps oh so much. So we shall be each others’ life preservers and we will all make it through – even if we’re only treading water right now – and life will be better & we will be stronger & MAN will we have some rockin’ legs to show for it. So thank you. For reading, for commenting, for chatting. Over the past few days and even during my yet-another-crazy-busy-but-fun weekend, I did a lot of thinking about how to make my current life more manageable. I made lists (I love lists), set some manageable goals, thought about rewards and balance, and made some tough cuts. But I feel way better about everything now, so I consider it so far successful! I will keep you updated, and tell you a bit later (when I have a moment…) about what I’ve decided and figured out, the lists I’ve made and what I’ve had to cut to make everything fit. Thanks again for being awesome and uplifting. This is what the blog community is all about! I’m sinking. 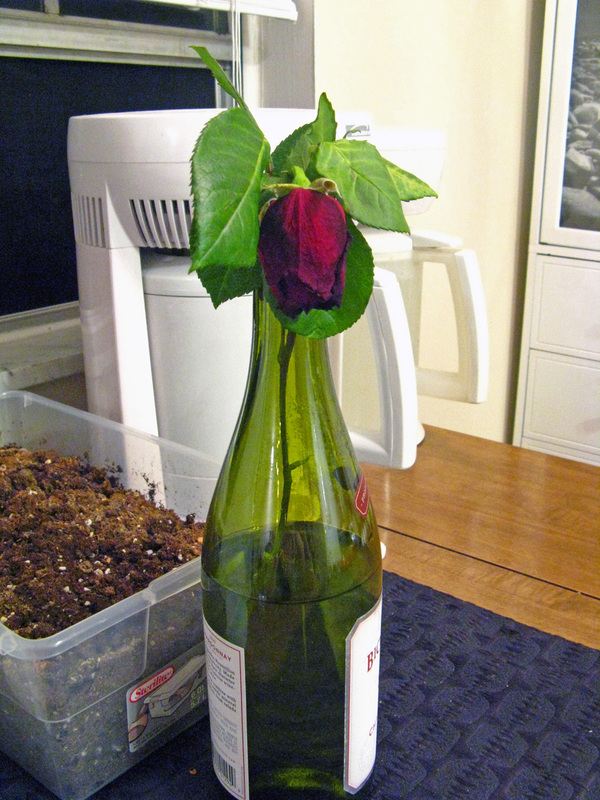 Wilting. Fading fast. Whatever you want to call it. I’m overwhelmed and I’m not even sure by what. I have too much to do but no motivation to even start. So I don’t do anything. Or I do the things I want to do, but only the ones that I don’t think will take up too much time. It’s a lot like when I had a project due at school. I would pick up my clothes because it only took a few minutes, so I could put off working without feeling too bad about it. Until I had so much to do that even the easy things would slide. I know it’s getting bad when I stop making my bed. Like this morning. Even a venti latte from Starbucks could not pull me out of my funk. It’s crazy – I’m doing all these fun things that I enjoy, and I should be having a great time. I see friends, I join groups, I go for walks and on adventures. But when I wake up in the morning, I feel like a zombie. All the fun on the weekends means that I have to fit in chores after work, and my lovely commute pushes that back about 40 minutes. So if it’s cloudy, I don’t have sunlight left to run when I get home even if I DO find the motivation to do that. I’m having trouble balancing the things I need to do with the things I want to do. Want: travel; Need: go to work. I need a better way to make time for the things that I want without always feeling like I’m drowning in the things I need to do. And perhaps I need to re-prioritize the things in my life that I want and need to do – to minimize in my whole life, not just my possessions (which I haven’t been doing, by the way). Uggh.